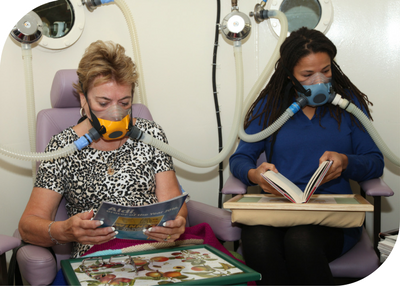 Oxygen treatment involves breathing pure oxygen through a mask whilst sitting in a pressurised chamber. Don’t worry if you have never heard of it before, many people don’t know about it and chambers are few and far between. In fact, we have the only one in Berkshire. Our chamber sits up to seven people inside and we have an additional non-pressurised surface breathing position. The chamber is accessible for people in wheelchairs and oxygen treatment is safe and non-intrusive. Attended the oxygen treatment before? Simply call the Centre on 0118 901 6000 to book. If you have MS and are new to the Centre or oxygen treatment please contact Tracy who can arrange an introductory visit and an induction to oxygen including a mask fitting. For those with other conditions please fill in the form here.